Our Technician class ended last night with the administration of exams. It was a mixed bag of results. At the beginning of the class, we had eleven students. Two of the students were actually licensed during our last class and were attending this class as a refresher in addition to home study in preparation for taking the General class exam. One student decided to take the exam a few weeks ago and passed. Another student had to temporarily move up to Massachusetts because of a family issue and is going to take the test up there. Three students couldn't make it last night and are coming to our normal, monthly VE session, the next of which will be on Saturday, April 14th. One was away competing in a track and field event. I'm not sure what he plans to do about the exam. So that left five students to take their exams last night. Four took the Technician and one took the General. Three passed their Technician test and the one student upgraded to General. The one who did not pass was crushed. I am sorry to say. However, the good news is that a local hospital has had some employees engage in a self study course. They are holding a one day review and exam session this coming Friday. Our candidate was made aware of that; and I am fairly sure she is going to attend. I think with a little more review and pin pointed study; that she will be successful in getting her license. It's not that she doesn't know the material, I think she's just one of those people for whom taking tests is difficult. During our classes she was always quick to answer practice questions correctly. Put a test paper in front of her and the pressure mounts. Unfortunately, that is a situation many of us face. All our students who took the Tech exam and passed, also took the General exam. We tell them that it is normal for most new Techs who have not studied for the General to get about 50% of the answers correct. One of our new Techs missed his General by one question! He will also be coming back on April 14th and I'm sure he'll pass with flying colors. It will be interesting to see the results from this Friday and April 14th. It's always our goal as instructors that everyone who attends our classes walks away with their ticket. I hope that holds true. Diz, W8DIZ has a new offering - a Universal HF receiver. The price is $20 for the main board and each band module is $10. Looks to be a nice kit, modestly priced that will allow you to have some fun and do some experimenting. Diz offers suggestions for implementing a digital display and the like. It's nice to see so may low priced, high quality kits being offered, especially through the QRP community. I saw a post by Hans Summers from QRP Labs, that he has sold over 4,000 QCX kits. Bob W3BBO raves about his and Dave AA7EE had good words to say as well. Two very highly respected opinions that are inching me closer and closer towards sending Hans some $$ in order to build one myself. The only question would be 40 or 20 Meters? It's hard to believe that Easter Sunday is this coming weekend. When I opened the door this morning to leave for work, it was only 24F (-4C) and there was frost all over the car windows. It feels more like mid-Winter than Spring. To add insult to injury, I saw where AccuWeather is posting about a polar vortex for the first week of April that will keep the Northeast in temperatures well below normal. I'm itching to start bringing the radio gear with me to work, so that I can resume lunch time QRP operations again. As I get older, it gets tougher for me to deal with colder temps. Back when I was working at Sinar Bron some 11 or 12 years ago, I was headed out to the parking lot just about every day at lunch time, no matter what time of year it was. Cold temperatures didn't seem to phase me as much as they do now. My knees and hands seem to work much better in temperate weather. Tonight, our Technician License class concludes with the exam being administered. One student gave it a go early and got her license a few weeks ago at a local VE session. It was very gratifying to see her enthusiasm and excitement when she came in last week to tell us all about it. I think it also helped alleviate some of the jitters that some other classmates may be experiencing. It's always easier when it's all over; but I really, truly do expect a 100% passing rate tonight. This is one of the best groups of students that it's been my honor to have instructed. Sort of - more of a personal story; and believe it or not, one that DOES have something to do with Amateur Radio. Flashback to 1997, the year I met my wife, Marianne. We had dated a few times before that fateful event that every boyfriend goes through - meeting the girlfriend's parents. My future in-laws were great! We got along and loved each other very much, but of course when you meet them for the very first time, you never know how it's going to turn out. As I recall the incident now, I was sitting at my in-law's kitchen table. We had finished eating something and we were sitting around, shooting the breeze. We were just making harmless small talk when somehow, and for some reason, I had mentioned that I was an Amateur Radio operator. My future Mother-In-Law, who was Irish - and I mean Irish (born in Donegal) came to complete dead silence. I had gotten a strange look, and I felt the room in the temperature drop about 20 degrees. "You're a radio operator, you say?" she asked in her distinctive Irish brogue. I responded in the affirmative and then explained my small station, my two small antennas and the various things that I liked to do in the hobby. The response that I got was non-committal in either way, not unfavorable; but not enthusiastic, either. Later on, I asked Marianne what that was all about. It was then that I got the story. Her uncle, Lawrence McCrea, who was my future Mother-In-Law's brother-in-law, was a farmer in Ireland. He was also a Ham. More about this in a bit. Uncle Larry had a big farm and he also had a big antenna on a tower right next to the farmhouse. One day, during a thunderstorm, Uncle Larry's tower took a direct lightning strike and the farmhouse suffered from quite the fire as a result. In my Mother-In-Law's mind, that meant every Amateur Radio antenna, no matter what kind it is, is automatically a magnet for lightning. She was deathly afraid that I would bring fire down upon whatever house we would purchase in the future. Many years later, back in 2009 or so, my Mother-In-Law would suffer a fall which resulted in a broken hip. After her surgery, she came to live with us for a period of three months. I don't think she was too happy about staying with us, knowing that there were antennas involved! She never said anything about it to me directly, but I think that was always in the back of her mind. She went on to live in Senior housing, very independently for another three years. We lost my Mom and my Mother-In-Law the same year, in 2012. I miss them both, so much! I have no idea what Uncle Larry's call sign was. I never met him; and I think he might have been a Silent Key by the time Marianne and I got married. All I know was that he lived in the area of Donegal in Ireland. Marianne has since informed me that he was from Abbeylands, Ballyshannon, County Donegal. If there are any Hams out there, particularly Irish Hams who might have worked him, or might have known him, I'd appreciate hearing from you. If anyone has a QSL card from Lawrence McCrea and could fire off a scanned copy to me, I'd really love that! 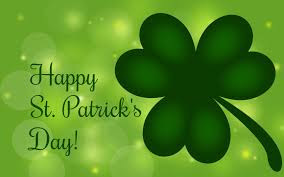 In any event, to all my friends, particularly my Irish friends - Happy St. Partick's Day! Every now and then, I'll "Google" Amateur Radio and hit the news tab, to see if anything interesting pops up. This time, a story came up about an 80 year old Ham from Martha's Vineyard in Massachusetts, who was rescued from his tower earlier this week. It would appear that he was climbing his tower to secure something in advance of one the Nor'easters to go through lately. "William Welch, an electrician and avid amateur radio operator, got his sneaker caught atop a 20-foot-tall backyard antenna after he scaled the structure to secure it ahead of the impending nor’easter, his wife Betty told The Times." Sneakers? Really? Now look, I'm not a tower owner or climber, but it would seem to be common sense to me that were you to climb a tower, you'd want to be wearing work boots with a steel toe and even perhaps a steel reinforced sole. To this uneducated Amateur Radio Op, sneakers don't seem to be the "de rigueur" for tower climbs. "Firefighters moved back and forth over the ladder and put a helmet on Welch and fitted him with a harness. The harness was fastened to the tower, so Welch couldn’t fall. " So you mean to tell me that he climbed a tower with NO hard hat or climbing harness? I sincerely hope this was just a case of bad reporting. I know I'm NOT the voice of experience or expertise ....... but seriously? No hard hat, no climbing harness, and it seems like no climbing partner, unless you count his wife who may have been watching from the ground. We're finishing up an 8 week TECHNICIAN CLASS license course and even there, tower climbing safety is really stressed. Hard hat, climbing harness and NEVER CLIMB ALONE are stressed over and over and over! If this is par for the course for this gentleman, than he's very lucky to have made it to 80. I hope this caused him to take pause and re-evaluate his past practice, and perhaps bone up on tower climbing safety. And while he's at it, perhaps say a prayer of thanks that things didn't turn out way worse than they did. Although I'm a Marvel fan - this was too good to pass by. 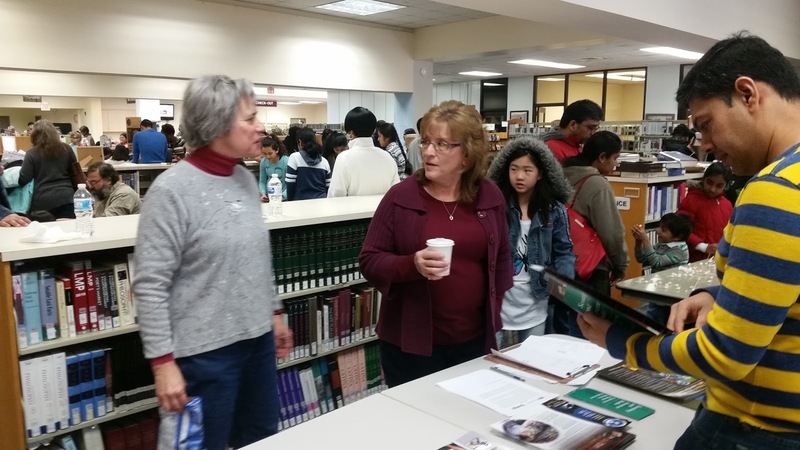 Yesterday was New Jersey Maker's Day, and I previously mentioned, the local venue was the John F. Kennedy Library in Piscataway, NJ. 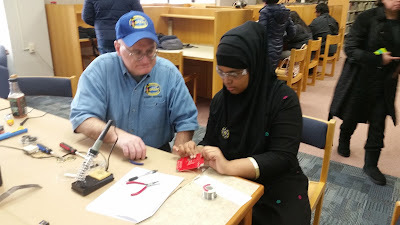 The South Plainfield Amateur Radio Club was asked to participate, and we came up with a plan, and did. Participate ......that is. 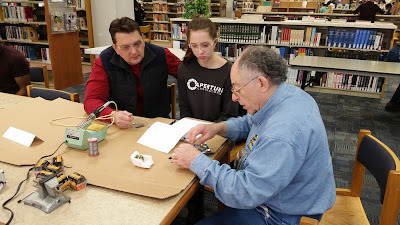 The plan was to acquire 20 Simple Morse Code Practice Oscillator Kits from the 4 States QRP Group and to make them available free of charge, to any youngster of reasonable age who was willing to build one (with parental approval, of course). This was to be a totally mentored project, with a SPARC member sitting one on one with the builder, guiding them through the entire process. 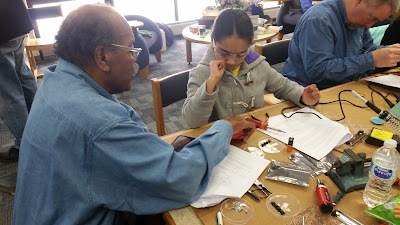 Our goal was to teach basic kit building and soldering skills, perhaps a little electronics theory and work in some interest in Amateur Radio in the process. The kits were acquired through donations from a local business and the Boyle Family Education Foundation, a local concern that donates to causes that further the education of local youth. 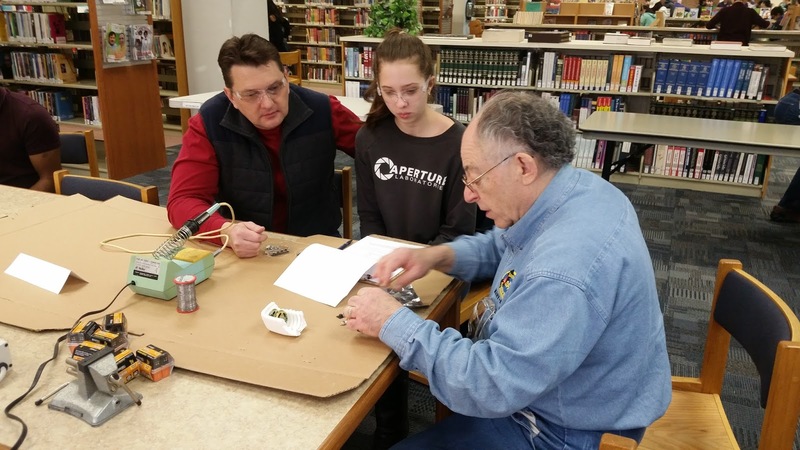 SPARC members provided the tools, the soldering stations, the know how and the passion for passing on knowledge and love for our great hobby onto a younger generation. 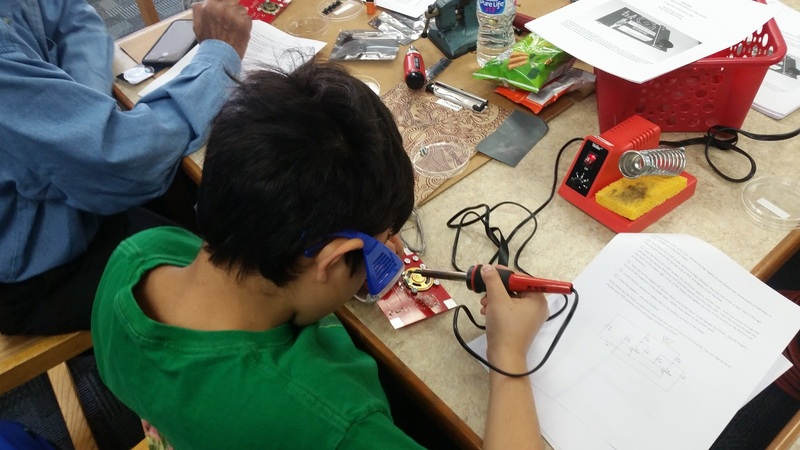 From past experience, we knew that kids are fascinated with Morse Code - simply because it's different. That's why we picked the 4 States QRP Group kit. It had a small number of components, it's easy to build in a relatively short amount of time, and it left each builder with a memento of the day. To say the day was a rousing success would be an understatement. Our section was one of the most popular and the most visited. We were right up there with the robotics display. In addition to the actual kit building, Dave KD2FSI had his rig set up to a 24 inch monitor and had his laptop running a program (Fldigi, I think) that was decoding actual Morse Code being sent on the air. Dave set up his AlexLoop and was monitoring the BERU contest on 40 Meters. Kids and adults alike got a kick out of seeing the code made understandable for them, live and real time. 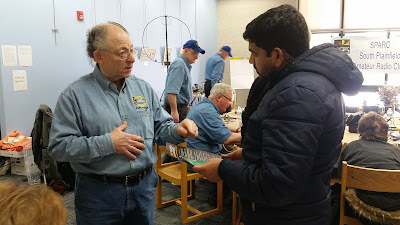 We had a reception table where SPARC members took requests for kit builds and there was plenty of ARRL material about Amateur Radio available to anyone who wanted it. Our Section Manager, Rob Roschewsk KA2PBT came down for the morning and even served as a mentor for a kit build. Even though the kit was a simple, through hole build, we allotted an hour for each. 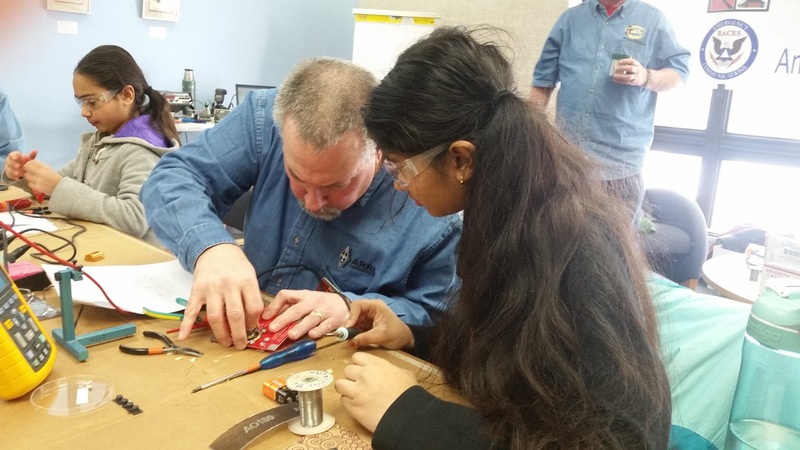 We took into consideration that the youngsters would probably have no soldering experience and that learning how to solder would be part of the process. We had four stations set up, so we planned to get four kits assembled per hour, with five hourly time slots to fill up the day. From start to finish, everything went very well. There was a small glitch in that a number of the kits were missing some screws, but a quick run to Home Depot by yours truly took care of that situation. The ratio of kits that worked right off the bat to those that needed some TLC was about 50/50. In one incident, a transistor was soldered in backwards, in another the battery contacts were reversed. The code practice oscillator was rugged enough to withstand these mishaps, and once corrected, they buzzed away, quite happily. There were of course, the expected cold solder joints and those were corrected, my failing eyesight notwithstanding. The number of solder connections on each circuit board was low enough so that when I had to, touching up every solder connection in a kit took less than a minute. 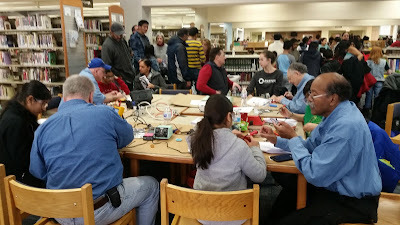 As we were breaking down and cleaning up at 4:00 PM, the person from the library responsible for putting on Maker's Day came by and told us how pleased she was with our participation. 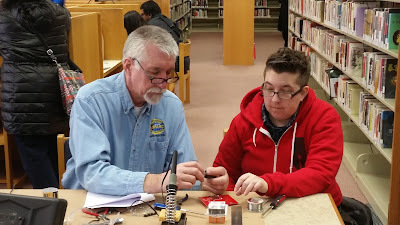 Not only were we invited to come back next year, but we were also asked about the possibility of running a Technician Licensing Class some time later this year, at the library. 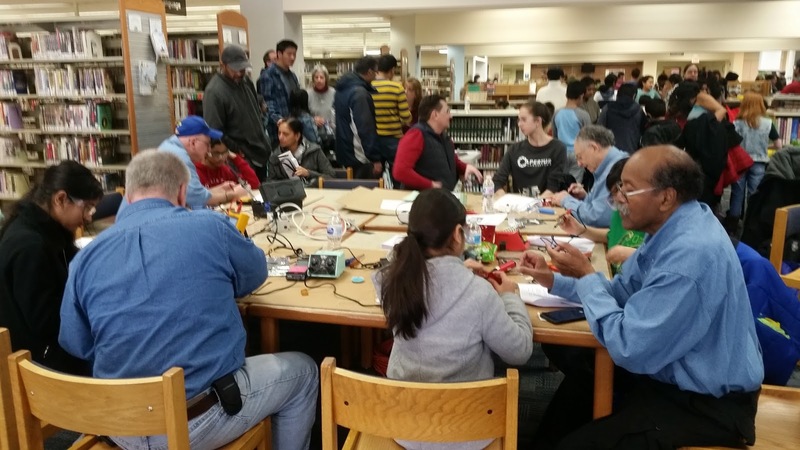 So all in all, Amateur Radio had a nice showing at Maker's Day. Our next project is to make ourselves available at a Boy Scout Merit Badge Fair in April. And the beat about spreading the word about Amateur Radio goes on! Not an Amateur Radio post in the strictest sense. The weather has been the big topic in this area since last Friday. That's when we had a Nor'easter blow through that caused a lot of problems. For the most part, precipitation wasn't a problem for most areas. In fact, it snowed throughout the day with no accumulations, except at the higher elevations, mostly in the Northwest part of New Jersey. Once again, like Sandy some five years ago, the wind was the big factor. The winds were so strong that my PWS (personal weather station) which is mounted to a mast, anchored in a 100 pound bucket of cement, got blown over a bit during the event. It didn't tip over and hit the ground, but the wind leaned it just a bit (maybe 20 degrees from true vertical) and the anemometer was blocked by a piece of tall brush overhanging from my neighbor's yard. So for a period of about two hours, the anemometer wasn't spinning and recording wind data. I up-righted it when I got home from work and secured the mast to the chain link fence with two bungee cords to prevent that from happening again. To that point, I had a recorded gust of about 30 mph, but God only knows what I missed. I'm sure I missed recording the record high wind gusts for the day because there were a lot of trees down in town; and as a result a lot of downed power lines. Knock on wood, our house lost power for all of about 5 seconds, more of a power blip than anything else. Long enough for the clock on the kitchen stove to display a "PF", though. There was no damage, per se, at the W2LJ residence. Some minor twigs and branches came down, only. In fact, there was a side benefit, and here comes the Amateur Radio part of this post. When I elevated my W3EDP in the maple in the backyard last Fall, the wire got tangled up in the branches and took on a zig-zag kind of route. The wind actually caused the branches to move enough to un-snare the wire some! It's still not perfectly untangled, but it's a lot better than it was. Tomorrow is another story. Another Nor'easter, but this time the track is different and the air is colder. Currently, the forecast for us is for 6 - 12 inches of snow. The wet, heavy March kind of snow. I'm not looking forward to shoveling and I'm not looking forward to driving back and forth to and from work in the mess of it all. It certainly would be a good day to hang out in the shack and make a few QSOs! 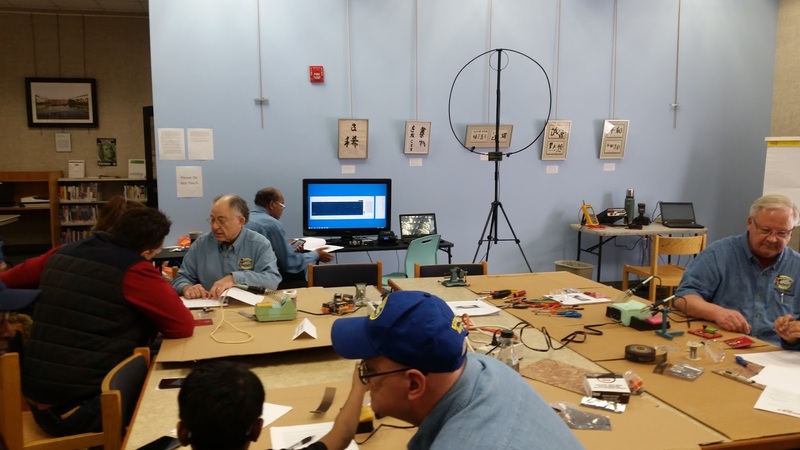 About a year or so ago, you might remember a survey that the ARRL conducted, asking licensed Amateur Radio Ops in the USA how they felt towards a new Entry Level License Class. According to the League, the results of that survey have led to "recommendations put forth by the ARRL Board of Directors’ Entry-Level License Committee, which explored various initiatives and gauged member opinions in 2016 and 2017." Instead of coming up with an entirely new license class, the ARRL is petitioning the FCC to expand the privileges of the Technician Class license. In particular, they are requesting "to provide Technician licensees, present and future, with phone privileges at 3.900 to 4.000 MHz, 7.225 to 7.300 MHz, and 21.350 to 21.450 MHz, plus RTTY and digital privileges in the current Technician allocations on 80, 40, 15, and 10 meters." "The ARRL petition points out the explosion in popularity of various digital modes over the past 2 decades. Under the ARRL plan, the maximum HF power level for Technician operators would remain at 200 W PEP. The few remaining Novice licensees would gain no new privileges under the League’s proposal. The Entry-Level License Committee determined that the current Technician class question pool already covers far more material than necessary for an entry-level exam to validate expanded privileges. ARRL told the FCC that it would continue to refine examination preparation and training materials aimed at STEM topics, increase outreach and recruitment, work with Amateur Radio clubs, and encourage educational institutions to utilize Amateur Radio in STEM and other experiential learning programs." 1) The Technician Class license has become the de facto "Entry Class License" ever since the FCC stupidly (my opinion, please) eliminated the Novice Class license. The Technician Class license inherited the Novice HF privileges, but they were for Morse Code only. Since the Morse Code requirement was eliminated, it seems to make sense that the Technician Class license should now include some HF Phone. The League is NOT proposing to give Techs the same privileges that General Class licensees have - they're giving them about 1/2 (roughly) that the Generals get, so there's still an incentive to upgrade. 2) Personally, I DO NOT care for this part: "RTTY and digital privileges in the current Technician allocations on 80, 40, 15, and 10 meters." Anyone who reads this blog on a regular basis know the affinity I have for CW and Morse Code operations. This feels like an attempt by the ARRL to further erase that mode from existence. It's bad enough when you're in a rag chew and you get blasted away by a digital signal by an existing General, Advanced or Amateur Extra Class licensee. Can you imagine the result of all of a sudden allowing 378,000 new users in to that space with new digital privileges? The Technician Class licensees represent the bulk of the amount of Amateur Radio operators in the States. I can easily imagine that the CW bands will become overly dominated by RTTY and other digital signals, with the sudden influx of so many licensees. And yes, I know CW is allowed anywhere - and it may result that we may have to resort to using CW in new and "unconventional" places - like the unoccupied frequency areas of the "phone bands". 3) I know that many Amateur Ops resent an established license class just being handed new privileges without having to do anything extra to earn them. Whether or not that is a valid feeling is not being discussed here. I'm just making note that the sentiment exists. 4) Many Amateur Radio Ops will probably claim that this is just another attempt by the League to drive up membership. In fact, the figures of new League membership and retention of old memberships is pretty dismal. They may have a point, they may not - that is open to debate. Whatever your thoughts on this proposal, pro or con, remember that it's just a proposal for now. The FCC has not issued an NPRM (Notice of Proposed Rule Making) as of yet; and if and when they do (they could always dismiss this before getting to that point), we will all have ample time for making our voices heard. But .........pro or con, make sure your voice IS heard, if and when the time comes. Don't leave it up "to the other guy", because that "other guy" may also be leaving it up to "the other guy" - which is YOU! A number of customers considering the KX2 have asked us how it compares to the newly announced Yaesu FT-818. The latter is an updated ‘817, with a bit higher power output. In terms of form factor, the ‘818 is essentially unchanged from the ‘817. So it’s worth asking again: just how “ultra portable” can an HF radio be? The KX2 occupies 24 cubic inches, vs. 52 cubic inches for the ‘818. With dimensions about that of a medium-sized HT, the KX2 is truly pocket-sized. At just 13 ounces, the KX2 weighs 60% less than the ‘818. For hikers or backpackers, this means well over a pound of total weight saved. The light weight of the KX2 is also compatible with extended hand-held operation. The KX2 puts out up to 12 watts on 80-20 m and 10 watts on 17-10 m. This is roughly twice the FT-818’s max output (6 watts). The KX2 also includes highly effective speech compression (not included with the ‘818). Taken together, these advantages translate to more QSOs, especially in difficult conditions. The FT-818’s internal battery, at 18 watt-hours, has more capacity than the FT-817’s. But the KX2’s internal battery has still greater capacity -- 24 watt-hours. This extra 50% allows you to operate longer between recharges. Typical receive-mode current drain of the KX2 is 150 mA. The FT-818, at about 400 mA, is nearly three times higher. The KX2’s lower current, combined with the larger battery size, works out to over 4 times longer operating time RX-only, or 2 to 3 times longer for typical transceive operation. The KX2 has a wide-range internal ATU option that allows multi-band use of ad-hoc field antennas, whips, etc. There’s no need to carry a separate antenna tuner, loading coils, or even coax: just attach a wire or collapsible whip directly to the radio, and let the ATU do the work. Unlike the ‘818 or ‘817, the KX2 includes digital signal processing (32-bit I.F. DSP). This provides a wide range of features typically found only on desktop radios, including: adjustable noise reduction and noise blanking, auto-notch, variable filter bandwidth/shift, audio peaking filter for CW, full stereo receive, and RX/TX EQ. You can even listen on both VFO A and B frequencies at the same time (dual watch). The KX2 offers built-in PSK31, PSK63, RTTY, and CW encode/decode, with text displayed on its alphanumeric LCD. CW and data-mode QSOs can even be logged internally, then sent to a PC when you return from a field outing. A computer can be connected to the KX2 via the supplied USB cable (for text display/keyboard) or via the headphone/mic jacks (for FT8 and other audio-based data modes). You can use either an external mic (MH4) or the KX2’s internal mic. The internal mic is positioned optimally for HT-style operation. In CW and DATA modes, you can use an external paddle, or directly attach our KXPD2, which weighs only one ounce and uses the rig itself as the base. For table-top use, the KX2 features a fold-out tilt-stand. This creates a 3-point mount that also works well on rough surfaces (ground, rocks, etc.). The KX2’s display is five times larger than the FT818’s, with separate VFO A and B fields, S/RF-meter and DSP passband graphic, icons showing operating state, and alphanumeric text capability. In addition, the KX2’s LCD is transflective; it is highly readable in direct sunlight. The backlight is highly efficient and can be turned off to further increase battery life. The KX3 is a bit larger than the KX2, though still smaller/lighter than competing all-band portables. It includes the following additional features: 160 and 6 meters; 2 or 4 meter optional internal transverter; nearly twice as many direct controls; and RX I/Q outputs for use with our PX3 panadapter or computer sound cards. The KX3 is available factory assembled or as a no-soldering kit. So there you have it. I know, I'm biased! And while I readily admit that I am indeed biased towards Elecraft, I would never denigrate anyone's differing opinion. My passion is portable ops and I just feel that as far as that goes, Elecraft gives you some of the best options available - especially for portable ops!. As an Elecraft user, I wasn't going to post about this, but the big news recently came out. All QRPers and Yaesu fans finally got the announcement they were waiting for. Yaesu made the public at large aware of their plan to replace the venerable FT-817 and introduced the new FT-818. I don't think that Yaesu got the reaction that they were looking for. Instead of excited anticipation, the reaction that I've seen from bloggers and on the e-mail lists that I've read was not so much "Wow!" or "Yay! ", but more like "Why bother?" or "Huh?". 2) An improvement in the battery. 3) The TXCO, which was an option before, is now standard equipment. I think, by and large, Yaesu fans were looking for an overhaul. They were anticipating something different than what is being offered as an improvement. Now don't get me wrong - the FT-817 has been a very fine piece of Amateur Radio equipment. It has a large fan base and a loyal customer base. It is a top notch performer and there are a lot of very satisfied users. My personal belief is that since the FT-817 has been on the market for so many years now, that the FT-818 was envisioned as to be something radically new, not just a "minor" upgrade. 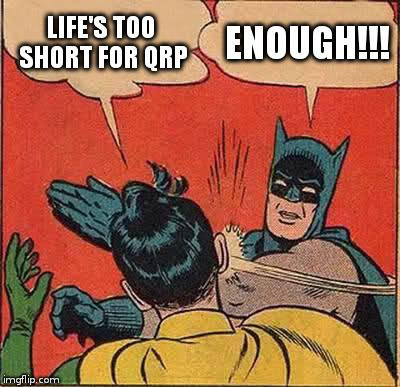 But when you look at it, QRP is still a niche market. I don't know how the FT-817 fit into the yearly sales earnings of the Yaesu brand. I would tend to think that if it accounted for a significant amount of their income, then they would have paid more attention to introducing something totally different. When in doubt, always "follow the money."